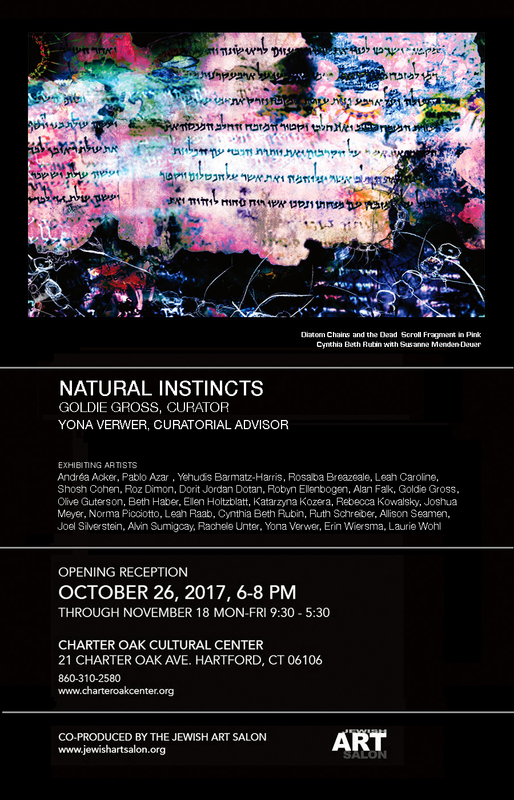 The Jewish Art Salon presents Natural Instincts, an exhibition hosted by the Charter Oak Cultural Center in Hartford, CT.
Charter Oak Cultural Center, Hartford, CT. This exhibition will bring together works that embody harmonious multiculturalism and inter- religious unity. In the current age, we focus on what divides, rather than what unites us. Artists are showing works that highlight our common humanity, rather than our differences. Andréa Acker, Pablo Azar , Yehudis Barmatz-Harris, Rosalba Breazeale, Leah Caroline, Shosh Cohen, Roz Dimon, Dorit Jordan Dotan, Robyn Ellenbogen, Alan Falk, Goldie Gross, Olive Guterson, Beth Haber, Ellen Holtzblatt, Katarzyna Kozera, Rebecca Kowalsky, Joshua Meyer, Norma Picciotto, Leah Raab, Cynthia Beth Rubin, Ruth Schreiber, Allison Seamen, Joel Silverstein, Alvin Sumigcay, Rachele Unter, Yona Verwer, Erin Wiersma, Laurie Wohl. This art exhibition is an excellent opportunity for dialog and reflection, as artists have the ability to unite cultures through their work and intentions in a unique way. This show offers an opportunity for open and honest conversation about how united, we can be stronger.